1. Start off by washing off your strawberries and drying them. Do this well before you plan to dip them in the chocolate so that the water doesn't effect how the chocolate sticks to the strawberries. 2. Use a mortar and pestle to smash up your almonds into little bits that are small enough to stick onto your chocolate covered strawberries. 3. Poor your coconut into a bowl big enough to dip your strawberries into. 4. Set a side two bowls. One larger than the other. 5. Boil water in a pot or in a tea kettle. Once the water has boiled poor some into the larger bowl. Don't poor too much as you don't want the water to overflow when you place the smaller bowl in the water. Once you've poured the hot water into the large bowl, place the smaller bowl inside. Poor the entire package of chocolate chips into the smaller bowl and allow to sit for 5-10 minutes. 6. 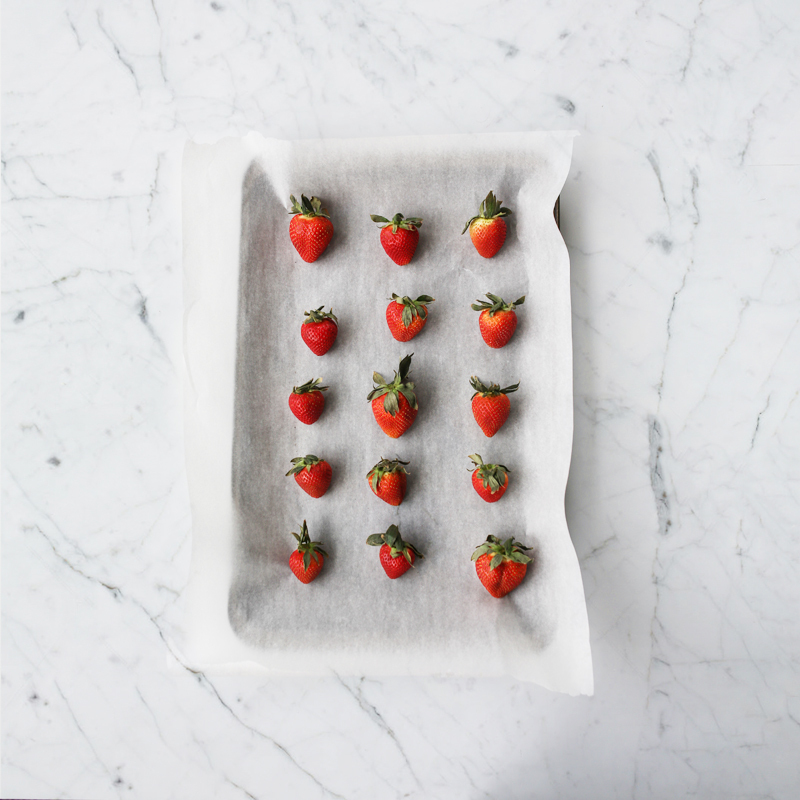 While the chocolate is melting, take out a cookie sheet and line it with parchment paper and lay out the strawberries on the cookie sheet. 7. When you notice the chocolate is beginning to melt stir it around lightly with a spoon. 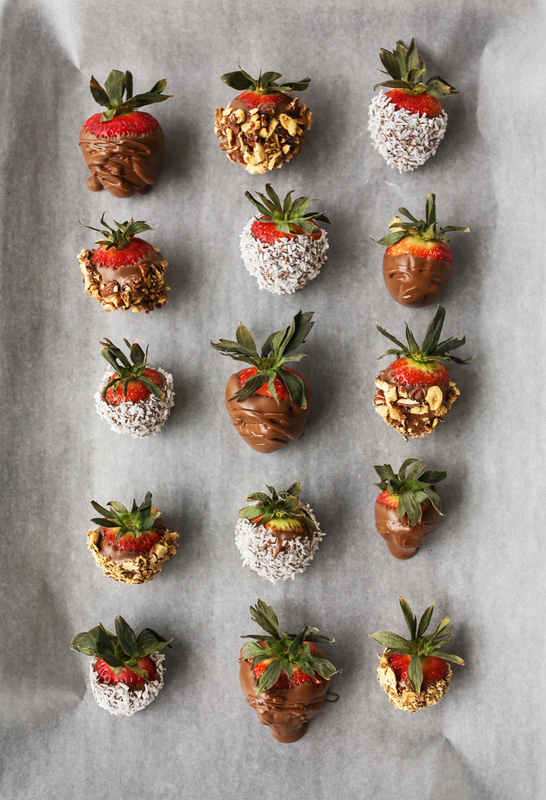 Once all of the chocolate has melted you can begin dipping your strawberries into the chocolate. Hold the strawberry by the stem and dip it into the chocolate. You can use a spoon to poor chocolate over the strawberry if your bowl isn't deep enough to cover the entire strawberry. You can then put the strawberry back on the parchment lined cookie sheet or dip it in the almonds or coconut. Continue this until you've run out of strawberries. If you have any left over chocolate left you can toss in some whole almonds or dried fruit and mix it around to coat them with the remaining chocolate. 8. 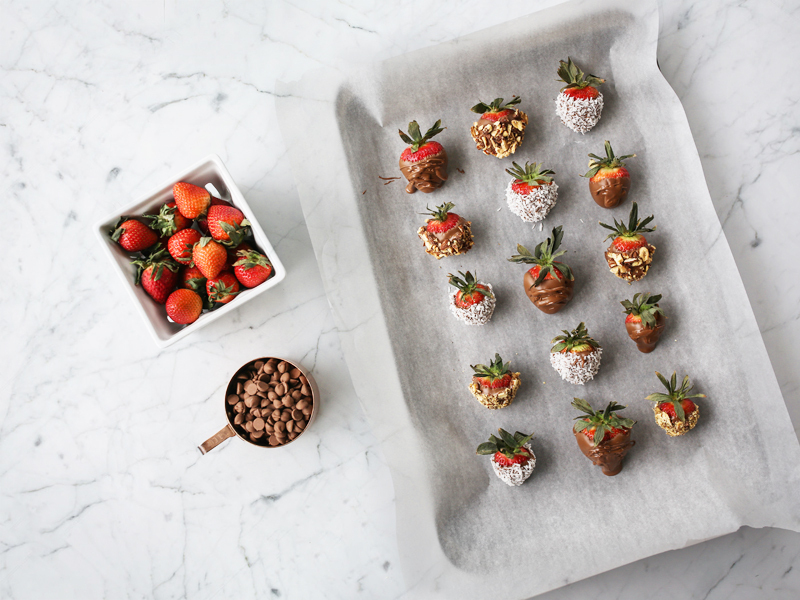 Place the cookie sheet in the fridge and leave your chocolate strawberries there until they're ready to be served.